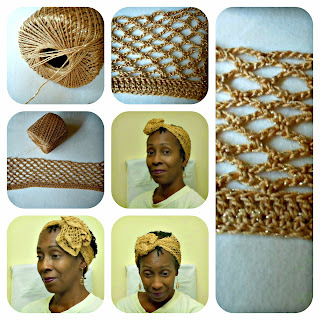 Some that may have followed some of my crocheting know that I love hats, facsinators and head wraps........Getting a chance to use my vintage bone crochet hook to crochet something was enjoyable. I have just about every color head wrap except gold. Gold really brightens up your skin, face and adds a nice touch to any outfit....I am a jeans person in the winter but more dresses in the summer. Row 1: Crochet the single foundation chain. (If you forgot how here is my Foundation Single Crochet stitch . Work over a multiple of 4 chains plus 2. (Basically crochet enough chains as to how wide you want your head wrap to be on your head). (I always make a couple more chains then what I think I will need, because with crochet thread it is thinner and folds nicely. For mine I crocheted seventy chains. Foundation - Row 2 Single crochet to the end of the row. crochet one chain then turn. Foundation - Row 3: 1 sc into the 6th ch from hook *ch 5, sk ch3, 1 sc into next ch, rep from * to end, turn. Row 4 - *Ch 5, 1 sc into next ch 5 sp; rep from * to end, turn. Rep Row 4 for length desired. If you have any questions please post in comment section. Until the next time keep the Faith and plenty of yarn! Ahhh the summer crochet months are here. Time to think about the coolness and colors of crocheting with the beautiful colors cotton yarn to make crocheted head wear. Just as in changing my clothing to lighter weighted fabrics I just automatically think of designing crocheted items from cotton yarn. I am still discovering the wide array of cotton yarns and their mixtures. I just experimented with 100% cotton yarn from Lily’s and Lion Brand’s cotton ease series. I also love the look and texture of Vanna White’s Glamour yarn line. Although this is not a cotton yarn the thin texture lends itself to a really comfortable weight for the summer months. Some crocheters have said it is scratchy, I have not found that to be true for me. I used Lily’s Sugar’n Cream cotton yarn for this head wrap. No knots or linty but can be a little stiff. The colors are great. Crochets quick and although soft doesn’t stretch. The braided headband I used Lion Brand’s Cotton Ease series. Just wish there were more colors. This yarn is thinner than Lily’s and I love the glitter aspect to it.